For the film, see Lunch Meat (film). "Cold cut" redirects here. For the English DJ duo, see Coldcut. For other uses, see Cold Cuts (disambiguation). 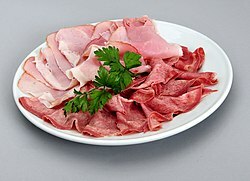 Most pre-sliced lunch meats are higher in fat, nitrates, and sodium than those that are sliced to order, as a larger exposed surface requires stronger preservatives. As a result, processed meats significantly contribute to incidence of heart disease and diabetes, even more so than red meat. A prospective study following 448,568 people across Europe showed a positive association between processed meat consumption and mortality, due to cardiovascular diseases and cancer. Similarly, a prospective study in United States following half a million people concluded a similar association with death and increased processed meat consumption. The World Cancer Research Fund International guidelines on cancer prevention recommend avoiding all processed meats. The US Centers for Disease Control and Prevention advises that those over 50 reheat lunch meats to "steaming hot" 165 °F (74 °C) and use them within four days. In Commonwealth countries, luncheon meat specifically refers to products that can include mechanically reclaimed meat and offal. In these countries, the terms "cold meats", "cooked meats", "deli meats", or "sliced meats" are used, instead. In Guatemala, a lunch meat is a traditional dish eaten in November. It is eaten the first and second day of the month to celebrate El día de Todos los Santos (All Saints' Day) and El día de Todos los Difuntos (All Souls' Day). The two types are red and white. The product got more popular after investigation what it contains. E.g. LUNCHEON MEAT TULIP (made in Denmark) is not made of 70% of meat as expected (base on country standard), but contains 18% of pork meat, 39% of chicken mechanically separated meat, 18% of pork mechanically separated meat. ^ a b Phil Lempert (27 December 2006). "The 5 things you need to know about deli meats". Today Food. NBC News. Retrieved 17 March 2013. ^ Micha, Renata; Michas, Georgios; Mozaffarian, Dariush (2012-12-01). "Unprocessed red and processed meats and risk of coronary artery disease and type 2 diabetes--an updated review of the evidence". Current Atherosclerosis Reports. 14 (6): 515–524. doi:10.1007/s11883-012-0282-8. ISSN 1534-6242. PMC 3483430. PMID 23001745. ^ Rohrmann, Sabine; Overvad, Kim; Bueno-de-Mesquita, H. Bas; Jakobsen, Marianne U.; Egeberg, Rikke; Tjønneland, Anne; Nailler, Laura; Boutron-Ruault, Marie-Christine; Clavel-Chapelon, Françoise (2013-01-01). "Meat consumption and mortality--results from the European Prospective Investigation into Cancer and Nutrition". BMC Medicine. 11: 63. doi:10.1186/1741-7015-11-63. ISSN 1741-7015. PMC 3599112. PMID 23497300. ^ Sinha, Rashmi; Cross, Amanda J.; Graubard, Barry I.; Leitzmann, Michael F.; Schatzkin, Arthur (2009-03-23). "Meat intake and mortality: a prospective study of over half a million people". Archives of Internal Medicine. 169 (6): 562–571. doi:10.1001/archinternmed.2009.6. ISSN 1538-3679. PMC 2803089. PMID 19307518. ^ "Animal foods | World Cancer Research Fund International". wcrf.org. Retrieved 2015-12-17. ^ "CDC: Over 50? Heat cold cuts to 165 degrees to avoid listeria". USATODAY.com. ^ "Velký test lunchmeatů. Tohle čtení chce silný žaludek". Novinky.cz (in Czech). Retrieved 2017-07-20.